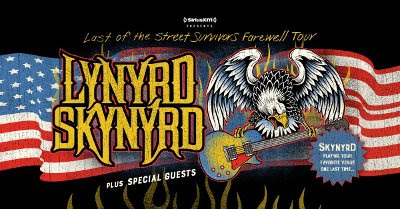 Today, it was Lynyrd Skynyrd's turn with the announcement of their Last of the Street Survivors Farewell Tour. Starting May 4 and running through September 1, the venerable southern rock band have thirty dates scheduled around the U.S. with guests on selected dates including Kid Rock, Hank Williams Jr., Charlie Daniels Band, Bad Company, Marshall Tucker Band, 38 Special, Blackberry Smoke and Blackfoot. Gary Rossington said "It's hard to imagine, after all these years, the band that Ronnie Van Zant, Allen Collins and myself started back in Jacksonville, would resonate for this long and to so many generations of fans. I’m certain they are looking down from above, amazed that the music has touched so many." Johnny Van Zandt added "we’ve been blessed by these great songs and the messages they carry to the fans. It’s been a true honor to try and fill in my brother’s footsteps for the past 31 years, keeping the music and his spirit alive."